I am not a morning person, despite how much I love to watch the sun rise. I prefer to work late. I would workout after noon every day if schedules and temperatures allowed. But even by my scale, I woke up feeling especially irritable on Monday this week. My head hurt. I hadn't gotten enough sleep. It was a holiday, so I felt like I should have been relaxed, but I just couldn't find it. I was on edge and testy, and when Quinn asked me to play with him, I practically begged him to let me read to him on the couch instead while I finished my coffee. 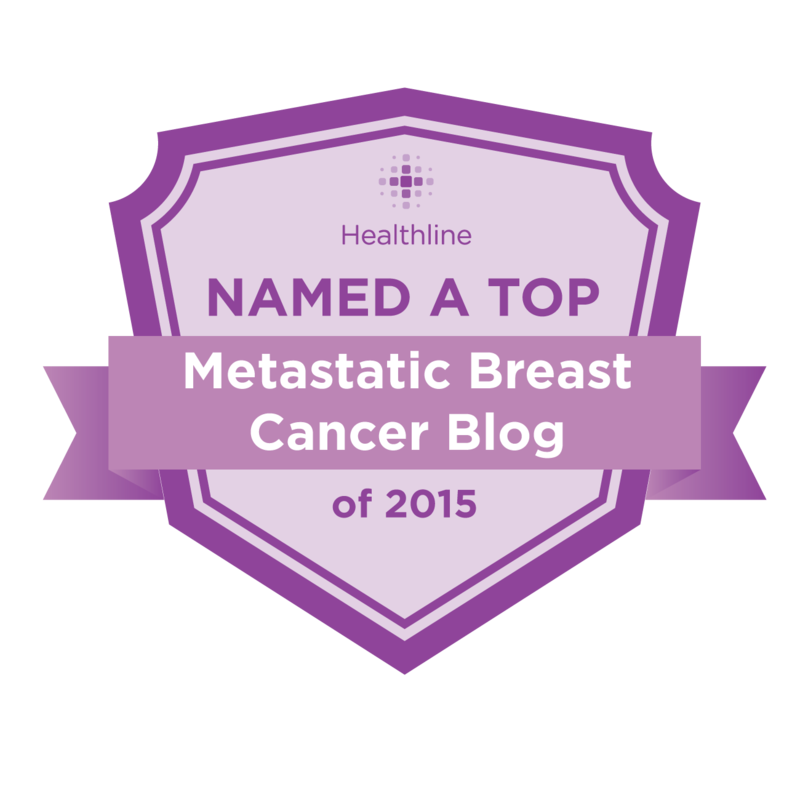 Last week, I'd been chatting online with a friend of mine, Renee, another mom with metastatic breast cancer. 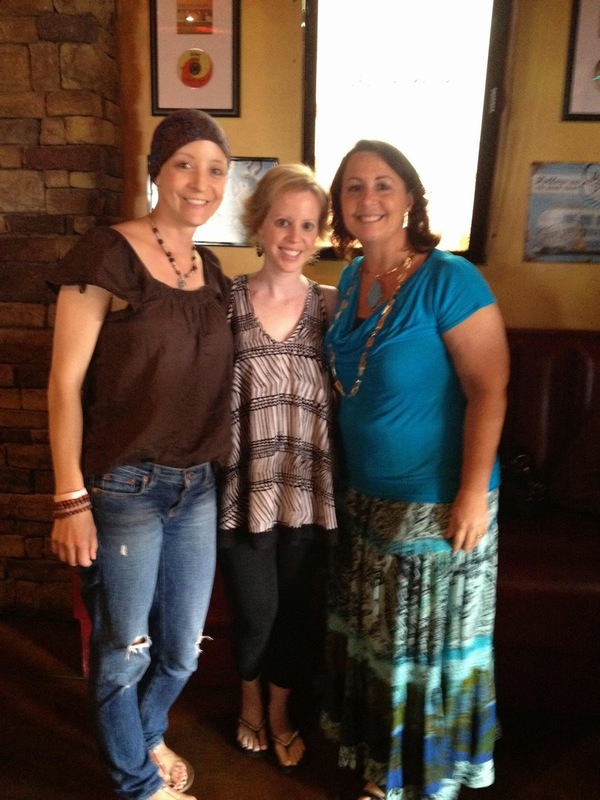 She'd run into our friend Brigid at chemo last Tuesday. They have the same oncologist and it wasn't unusual for them to see each other at the infusion center. I wanted to know how Brigid was, how she looked. I was hoping to get out to see her at her next appointment, in two weeks. Monday afternoon, I got this text from Renee: "My heart is broken." And I knew. I immediately checked Facebook and the first post in my feed was from Brigid's husband, on her account, letting us all know that she passed away Monday afternoon, after eight years of living with breast cancer. He said he'd never been more proud of anyone in his life. I couldn't help but think about what I hoped Chris would never have to write on my wall. I've been thinking and thinking about what to say about Brigid here, if anything. We weren't especially close, not in the way that I am with my oldest friends or the people I see every week. But there is an instant understanding when you meet someone who's had the same surgeries you've had, who has suffered the side effects of the drugs you're on, who knows what it's like to be bald more than once, who can commiserate about the never-ending cycle of scans and treatment and hope for a better option. Cancer, in its ugliness and brutality, creates intense bonds. I couldn't not write about Brigid. 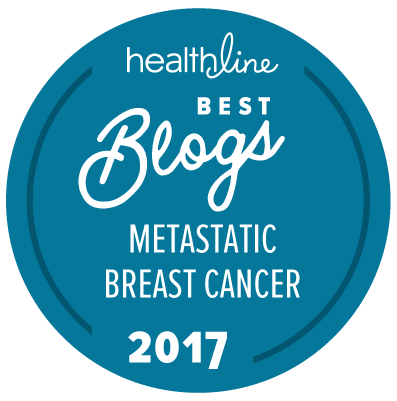 When I was diagnosed, she was one of the first people who gave me hope about what it means to live with metastatic breast cancer. In one of our early conversations, I asked her how she stayed so positive (the girl always had a smile on her face). She answered plainly, "I've never felt sick." I'm sure that changed over the past few months, as her cancer changed course and her treatments became more harsh, but her smile never faded. I, on the other hand, can hardly bring myself to smile before my second cup of coffee. One of the basic principles of every single art form has to do not with what's there--the music, the words, the movement, the dialogue, the paint--but with what isn't. In the visual arts it's called the "negative space"--the blank parts around and between objects, which is, of course, every bit as crucial as the objects themselves. The negative space allows us to see the nonnegative space in all its glory and gloom, its color and mystery and light. What isn't there gives what's there meaning. Imagine that. In Brigid's absence is a void, a negative space that reminds us of the "color and mystery and light" of the life she led. Of the brilliance that she shone on everyone she met. This isn't a perfect analogy, of course, because we are not better with her gone, but I am better for having known her. She did give what's here meaning. Brigid was small, only 4'11", so maybe it's fitting that words from this book resonated with me when I learned she'd died. Brigid was herself a tiny beautiful thing. I am so, so sorry for the loss if your friend. Heartbreaking is right. Please accept my condolences. Thanks, dear Catherine. It has been a rough week. I am still sifting through the emotions of it. Your kind words mean so much. I'm so sorry for Brigid's family's loss, your loss, and the loss to everyone she touched in her life. She does have a lovely smile. Love you Jen! Love you too, Leslie! And thank you. She was extraordinarily special. I am so very sorry for the loss of your friend. Me too. I'm tired of losing friends, but this one hit especially hard. Thanks for your condolences. So sorry to hear the news. Your writing is beautiful, always so articulate and expressive. Oh, thank you, Ellen. I hope I can shed some light on this disease and those of us affected by it. I just wish I didn't have to lose friends in the process. Hugs to you.